Everyone knows that productivity in the AECOO sector (Architecture, Engineering, Construction, Operation, Owner) is uniquely poor. Everyone also knows why. Stakeholders don’t play together well. We prefer to sue each other, write up change orders, and hoard information vs. collaborate from day one throughout the life-cycle of a project and/or built structure. So why don’t we change? Also an easy answer. The “culture” of our sector is embedded our minds and it will take a major event to enable change. The good news is that the “major event” is upon us… its the convergence of cloud computing / social media and driving economic and environmental market factors. The bad news is that many of us will not be able to make the transformation to our new work day. What will our new work day look like? 1. Collaborative construction delivery methods. Current examples being Job Order Contracting – JOC, Integrated Project Delivery – IPD, and Public Private Partnerships – PPP. 3. Life-cycle management and approach vs. our current “first-cost mentality”. There are simply too many resources (environment, economic, and opportunity costs) involved with the build environment to allow for the continuance of focus upon first costs and/or a “churn and burn” mentality. Surveys clearly show (an example below), that Owner and Contractor satisfaction improve when collaboration is prevalent and focus is upon value. In 2010 the amount of data collected since the dawn of humanity all the way up until 2003 was equivalent to the volume produced every two days in the new age of information. “Big data” — the ability to acquire, process and sort vast quantities of information for timely decision support is critical to the efficient life-cycle management of the built environment. To be certain, big data is NOT just a buzzword, but a term for rich information streaming in from multiple competencies which, leveraged appropriately, can be used collaboratively to drive better outcomes with respect to an organization’s core mission as a member of a larger community. Leveraging BIG DATA to achieve efficient life-cycle management of the built environment is not a trivial task, nor is it “rocket science”. It does however require the integration of robust business process, especially collaborative construction delivery methods, technology, and a standardized ontology. 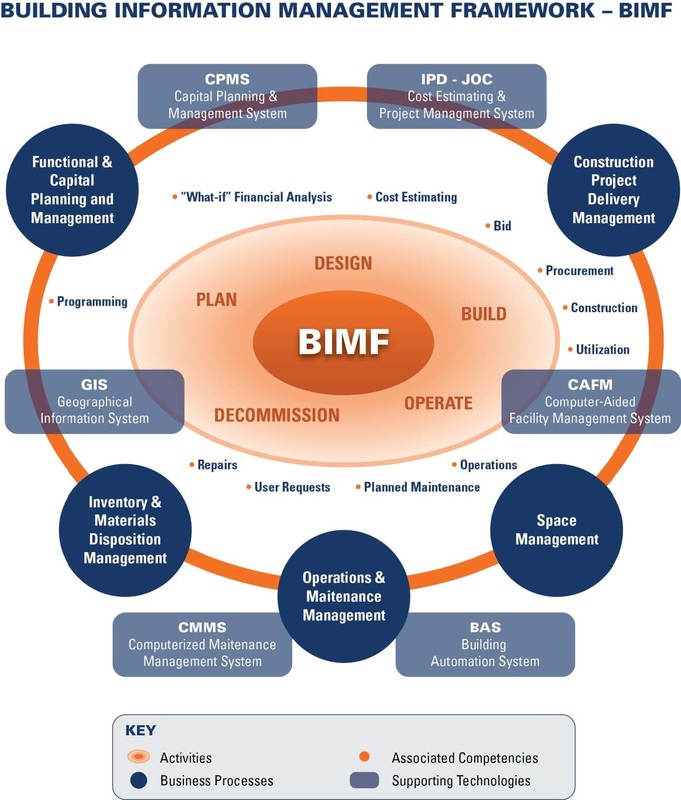 Building Information Management, BIM is defined as the life-cycle management of the built environment supported by digital technology (NBIMS – NIBS). Yet far too much emphasis to date has been upon the 3D visualization component of BIM vs. collaborative construction delivery methods, a standardized and robust ontology, and the use of open cloud computing technologies. These are far more important than 3D visualization when it comes down to improving how we improve total cost of ownership with respect to the built environment from both economic and environmental perspectives. The world is not flat, so why are out business processes within the AECOO (Architecture, Engineering, Construction, Operations, Owner) linear and static? Life-cycle management is on ongoing, dynamic process… actually the integration multiple ongoing/dynamic processes, with each having its own, yet inter-related “cycle” of planning, procuring, constructing, operating, and reusing. Using Big Data for life-cycle facility management is NOT just about technology. In point of fact, technology, process, people, and ontology must be viewed as inseparable and ever changing. Considering “ripple effect” of every decision is central to life-cycle management, thus “what-if” decision support systems are equally important. The new “rules of engagement” require a more “holistic” perspective of all stakeholders. 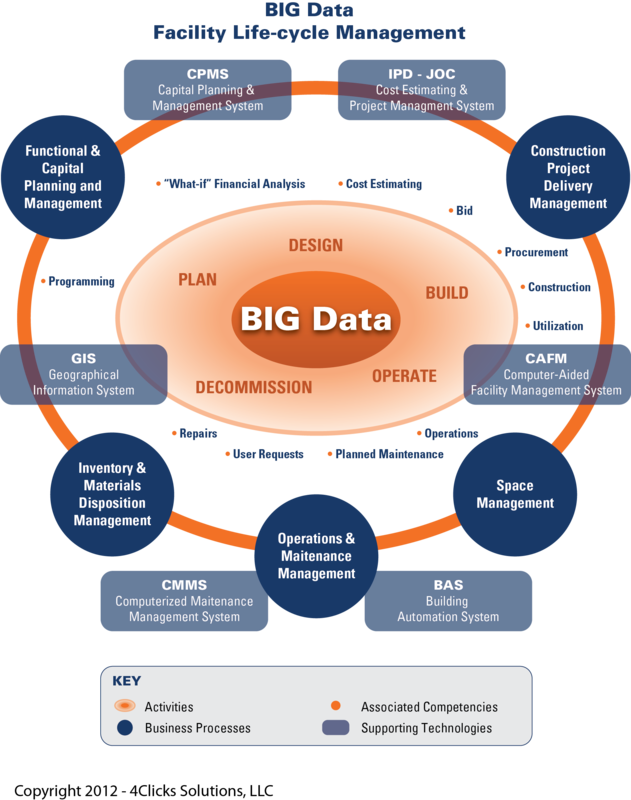 Thus BIM far more “about” the creation, sharing, and use of Big Data than it is 3D visualization and pretty pictures. So, how do we get from “A”, where we are now, to “B”, a more collaborative, transparent, and productive approach to managing the built environment? 1. Focus on process – the construction delivery method drives success/failure more than any other single component. Collaborative construction methods such as Integrated Project Delivery – IPD, and Job Order Contracting – JOC, also referred to as IPD-lite, are examples of proven, transparent, and performance based approaches. 2. Robust Ontology – the use of standardized terms, definitions, and data architectures are critical to enabling transparency, collaboration, and reducing waste. For example the use of standardized cost databases, such as RSMeans, and associated Uniformat/Masterformat…and eventual OMNICLASS frameworks as the foundation for development is one of several key considerations. 3. Leverage Technology – technology is a enabler, and not an a solution. Technology can, however, cause disruptive change to fundamental business processes. It is critical to adopt technology that is in concert with core strategies and dismiss those that are in conflict. For example, open cloud computing platforms that promote collaboration, scalability, information permanence and reuse are enablers, while dated monolithic software programs and even traditional relational databases should be seriously evaluated. In 2013, KPMG interviewed executives from 165 engineering and construction companies around the world, serving a range of markets including energy, power, industrial, healthcare/pharmaceutical, manufacturing, mining, education and government. The design and construction phases of a project consist of a sequential series of interrelated processes that are influenced by time, cost and quality. The choice of project delivery method can directly affect the overall time line and cost of a project—and has the potential to influence the working relationships among project participants, thereby affecting the quality of their performance. An owner chooses the project delivery method that is most advantageous to a particular project. The selected method is a contracting “tool” that will be used to administer the project’s construction phase and, with some methods, the design phase. Until recently, most project delivery methods fostered only process-oriented and, in a sense, distant relationships among project participants. These traditional methods involve selection and award of professional design services (to develop comprehensive, complete design documents), followed by a separate process for construction services to accomplish and deliver the project to the owner. These are commonly referred to as design-bid-build type methods and are still in use today. Currently, owners have several options other than traditional design-bid-build methods. These delivery method alternatives promote interaction among the owner, the design phase participants and the construction phase participants. These approaches have gained popularity in the construction industry, primarily because they can accelerate preconstruction time lines, but they offer other attributes as well. Job order contracting (JOC), which also is referred to as delivery order contracting or DOC, is one such method. JOC is well-matched to meet many of the project delivery needs of today’s facility owners—particularly owners involved in public education; municipalities; local, state, or federal agencies; and the military, as well as other entities with facility project needs, both public and private. JOB is an ideal project delivery method for minor construction, renovation, rehabilitation and maintenance projects. The quality of work performed is usually equal to or greater than any other project delivery method currently in use. Project costs are usually equal to or less than other methods, and the criteria used for pricing are typically firm, objective and consistent. JOC’s pricing structure provides consistently accurate and predictable project cost estimating, and the method can be used for construction work as well as for facilities maintenance or specific trade groups. In addition to these attributes, JOC contractors are service-oriented to the owner. JOC is a perfect match for owners who have the need to complete multiple small- to medium-size repair and renovation projects easily and quickly. Once a JOC contract is in place, the owner simply identifies each project with a brief description and notes the desired or required dates and times for performing the work. The JOC contractor is notified by the owner, who requests a design (if necessary), a detailed scope of work and a price proposal for the project. 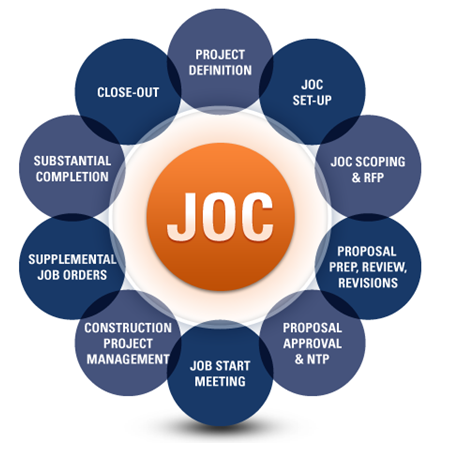 This process is commonly referred to in JOC as a Request for a Job Order (JOC) Proposal. The owner, JOC contractor, and designer (if necessary) work closely during the site visit to identify site characteristics and decide on the most economically advantageous means and methods needed to perform the work. The design (if needed), along with a detailed scope of work including the project’s performance times, is then submitted by the JOC contractor to the owner for consideration. Once these submittals are mutually agreed on, the JOC contractor submits a detailed, lump-sum fixed price proposal based on the defined scope of work. The combination of these submitted documents is referred to as the JOC contractor’s job order proposal. The owner reviews the price proposal for accuracy in accordance with the JOC contract provisions. When the JO proposal approval process is completed, the owner signs off on the proposal and the project can proceed as scheduled. With JOC, numerous projects can be in progress concurrently under one contract, allowing the owner to complete a high volume of projects as the need arises (subject to the contractor’s capabilities). The method is a good candidate for projects that require phasing to accommodate operations and/or budget constraints, and is particularly well-matched for projects with critical performance times. Additionally, having a JOC contractor already mobilized at a facility or in the surrounding area can give owners the capability of almost immediate mobilization for emergency projects. Adapted from Job Order Contracting: Expediting Construction Project Delivery, available through RSMeans, via http://www.4Clicks.com – Premier cost estimating and efficient project delivery software solutions for JOC, SABER, IDIQ, MATOC, SATOC, MACC, POCA, BOA, BOS … featuring an exclusively enhanced 400,000 line item RSMeans Cost Database, visual estimating/automatic quantity take off ( QTO), and collaborative contract/project/document management, all in one application. Our technology is currently serving over 85% of United States Air Force bases and rapidly growing numbers of other DOD and non-DOD (United States Army Corps of Engineers, Army, GSA, Homeland Security, VA..) federal departments/agencies, as well as state/county/local governments, colleges/universities, healthcare, and airports/transportation. RSMeans Strategic Partner. Construction Delivery Methods are a critical component of BIM as well as Facility Management in general. And no one enables JOC, and other construction delivery methods better than 4Clicks and RSMeans. Please join us February 3rd for a free WebCast. Track construction progress, documents, milestones, modifications, inspections, warranties, and closeouts quickly, easily, and with greater accuracy. Contractors and A/E’s also love working with our solutions as collaboration, communication, and longer term partnerships are enhanced for all parties. Join Michael Brown, Founder and President of 4Clicks Solutions, LLC, and Bob Gair, Principal, RSMeans for a discussion of a cost estimating, program management, and document management software specifically developed for Job Order Contracting, SABER, IDIQ, and similar project delivery methods. Why JOC is the most efficient construction project delivery method for facility repairs, renovation, and green/sustainability. How JOC can shorten the traditional construction procurement timeline from 15 weeks to 5 weeks. What a strategic partnership with RSMeans and a complete 400,000+ detailed line item cost database can do for you. How you can get away from spreadsheets or cumbersome, outdated software and nearly eliminate estimating errors, reduce project costs, and improve collaborative communications with internal and external project partners. The destiny of BIM is life-cycle facility management. When this will happen is anyone’s guess. In the interim, BIMers and FMers can learn a lot from JOC – Job Order Contracting. JOC is arguably the best construction project delivery method for facility renovation, repair, and sustainability. JOC shares the benefits of IPD (integrated project delivery) however, has a proven 25 years track record of success. In a time when the economy and global warming force a new focus upon existing buildings and efficiency…. JOC can delivery today. For these reasons that JOC adoption is rapidly accelerating in government, institution, and private sectors. .. and why BIM can learn from JOC. A building that integrates and optimizes all major high-performance building attributes, including energy efficiency, durability, life-cycle performance, and occupant productivity. A building that integrates and optimizes on a life cycle basis all major high performance attributes, including energy conservation, environment, safety, security, durability, accessibility, cost-benefit, productivity, sustainability, functionality, and operational considerations. High-performance buildings, which address human, environmental, economic and total societal impact, are the result of the application of the highest level design, construction, operation and maintenance principles—a paradigm change for the built environment.